Looking for a fun homemade Valentine’s Day card? These Valentine’s Day crafts are easy to make and fun to get. 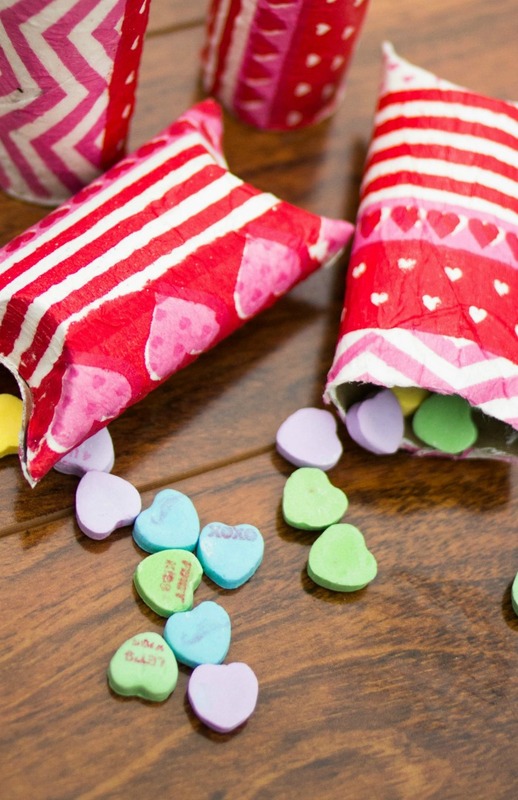 Create these Valentine’s Day Treat Holders with supplies from the dollar store. My daughters love to give Valentines to their friends but they don’t always want to give the kind of Valentine’s they sell in stores. 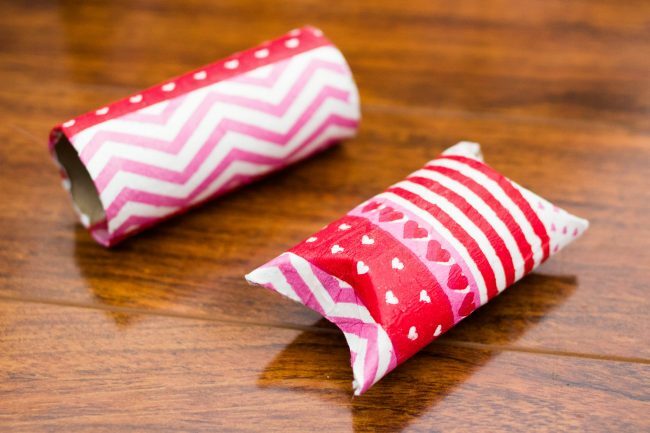 These Valentine’s Day treat holders are perfect for DIY Valentine’s Day Crafts. 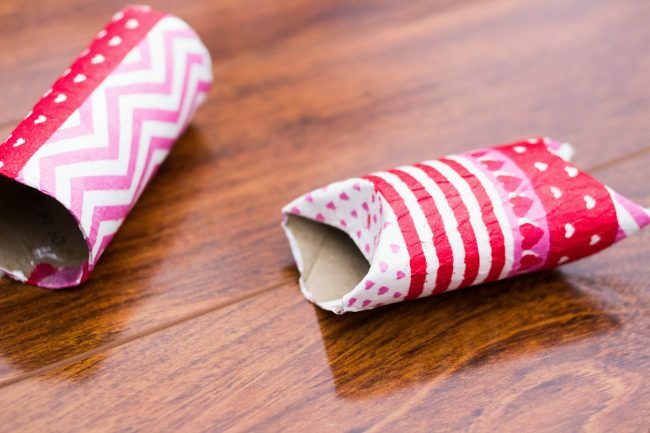 What makes this an even better DIY Valentine’s Day craft is that everything you need can be bought at the dollar store. That is always a winner in my house. I am always looking for homemade crafts to give away. Let me change that, I am always looking to inexpensive homemade crafts. So with Valentine’s Day here, I am looking for Valentine’s Day Homemade Crafts that the kids and I can make. In this case, we are looking for something the girls can use as homemade Valentine’s Day cards. 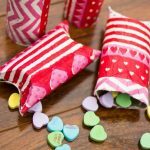 With these Valentine’s Day treat holders the girls can make these inexpensive Valentine’s Day Crafts for kids and they have something to give to their friends. 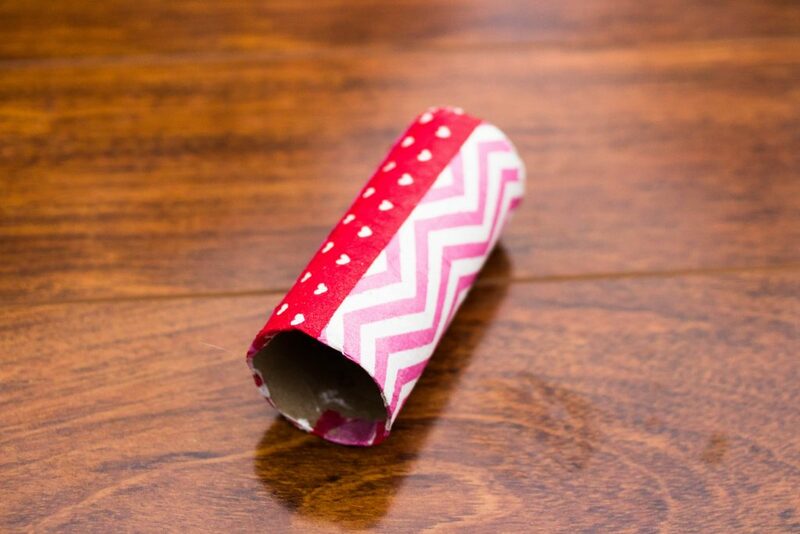 The Valentine’s Day candy holders are easy to make, can be made in an evening and are something different to make a homemade Valentine’s Day cards. After creating Valentine’s Day Treat Holder, the kids can write on the outside to say who it is to and who it is from. 1. Make sure the toilet paper roll is free of paper. Then paint it white. 2. Take the napkin and separate it from the back. 3. Once the roll is dry, paint the roll with a layer of Modge Podge. 4. Start wrapping the napkin around the toilet paper roll. 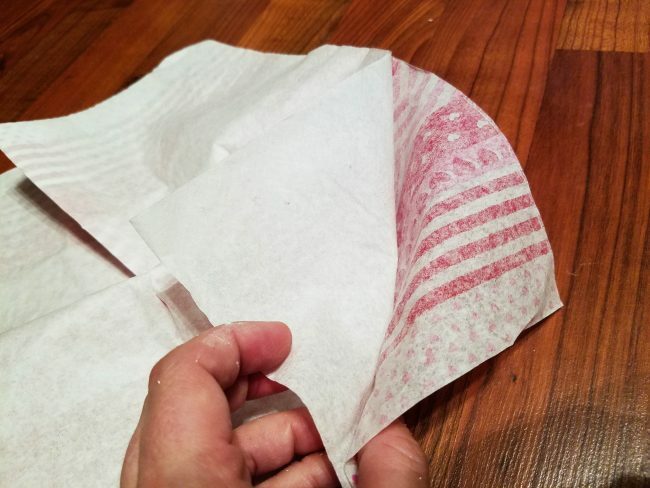 If there is extra napkin hanging over, trim the edges. 5. Add a layer of Modge Podge over the napkin. This will be smoothing the napkin down. Make sure to cover it all. 6. Once the Modge Podge is dry, you will be bending in the edges to create the pockets. 7. Bend one end, add the goodies and then fold in the other end. This is a simple craft that the kids can do, but also looks adorable. Looking for a fun homemade Valentine's Day card? 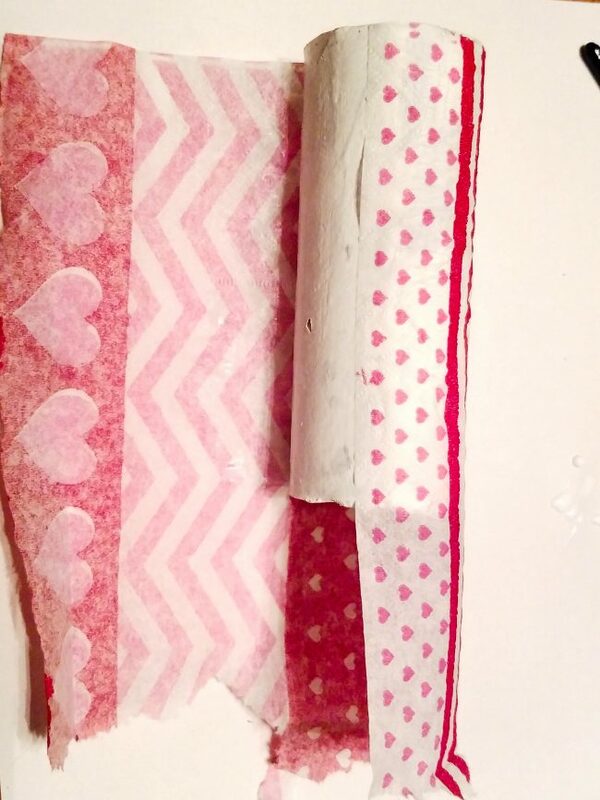 These Valentine's Day crafts are easy to make and fun to get. 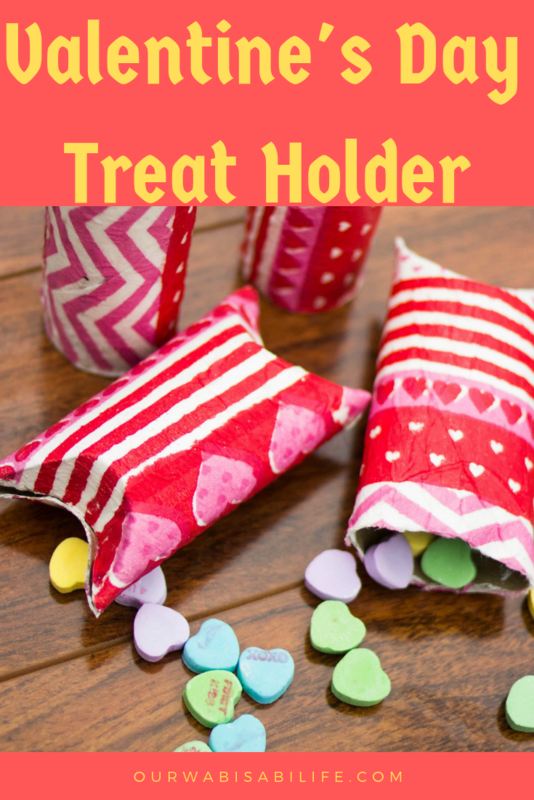 Create these Valentine's Day Treat Holders with supplies from the dollar store. Make sure the toilet paper roll is free of paper. Then paint it white. Take the napkin and separate it from the back. Once the roll is dry, paint the roll with a layer of Modge Podge. Start wrapping the napkin around the toilet paper roll. If there is extra napkin hanging over, trim the edges. Add a layer of Modge Podge over the napkin. This will be smoothing the napkin down. Make sure to cover it all. Once the Modge Podge is dry, you will be bending in the edges to create the pockets. Bend one end, add the goodies and then fold in the other end.